A collaboration of eleven innovative Klezmer women! 11 extraordinary women will be breathing contemporary life into the centuries-old tradition of Eastern European Jewish folk music! Annenberg Center for the Performing Arts. The show will tour North America under the auspices of MGAM, Inc. 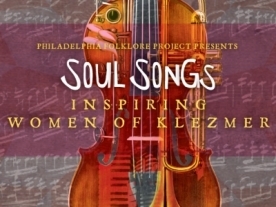 The brainchild of 4th generation klezmer musician and concert artistic director Susan Watts, SOUL SONGS: INSPIRING WOMEN OF KLEZMER was created from the world-renowned trumpeter’s concern for the future of her art and appreciation of every individual involved. After all, Watts represents the youngest generation of an important klezmer dynasty reaching back to the Jewish Ukraine of the 19th century. The show will feature new compositions, written and performed by three generations of women who bring contemporary meaning to this traditional Eastern European Jewish folk music form. Watts has assembled a stellar group of “Inspiring Women of Klezmer,” including Alicia Svigals, the world’s leading klezmer fiddler, and fellow violinists Cookie Segelstein and Deborah Strauss, pianist Marilyn Lerner, clarinetists Zoe Christiansen and Ilene Stahl, trombonist Rachel Lemisch, accordionist Lauren Brody, flute player Adrianne Greenbaum, and bassist Joanna Sternberg. Each artist’s work brings a distinct approach to innovating within the recognizable framework of the centuries-old genre. Working with Watts to fully realize her vision of “Soul Songs” as a true stage spectacle is Jenny Romaine, the highly acclaimed New York-based performer, director and puppeteer, who is the music director of the OBIE/Bessie Award winning free outdoor traveling circus, Circus Amok.